Subway has been running a scheme this month. They’ve introduced their “Italian Collection,” a line of subs featuring combinations of pepperoni and marinara sauce. These subs are a bit more expensive, running in the $6-7 range for a footlong. To make them seem a bit more like a bargain, Subway has decided to nuke their footlong of the month deal by offering the truly inexplicable Jalapeno Tuna Salad sub, which I will not be trying. Well played, Subway, well played. Pretty sure jalapenos and tuna salad is that thing that Meat Loaf wouldn't do for love. The Chicken Pizziola includes chopped chicken breast, pepperoni, marinara sauce, and cheese. Mozzarella would’ve been great, but since my Subway doesn’t offer it I went with American. I also added banana peppers, which as I may have mentioned before can turn a good sub into a great one. Here, they just helped the sub go from mediocre to decent. I wanted this sandwich to be good. I love chicken, and I love pepperoni. But they didn’t come together in a way that tasted real at all. The sub was a little dry, which may have been my fault for not asking they include more marinara. I think this sub in theory could work well, but it’d require more of a vision behind the counter than Subway can provide (maybe Quiznos?). The Chicken Pizziola runs for around $7. It’s not terrible, and if you really like chicken and pepperoni on a sub you could check it out, but the $5 meatball sub is a much better use of the marinara sauce. I can’t speak for the rest of the Collection, but it seems to me like a great Italian sub was there on the menu all along. I was gonna write a review of Subway’s Footlong of the Month for October, but it turns out they’re hosting Anytober, which means that almost every sub they offer is $5 for a footlong. This is a great deal no matter how you slice it, and you should consider most of my previous Subway reviews to be in full effect. However, I’d like to focus on one of Subway’s newest subs, the Oven Crisp Chicken. The Oven Crisp Chicken is perplexing. The chicken in question is a breaded chicken patty (or two, if you get the footlong) which is posited as a healthier alternative to fast food chicken. I don’t claim to be an expert on nutritional values, but a quick look shows that it’s not actually very healthy at all. It’s odd that Subway feels the need to compete so explicitly with McDonald’s style chains, considering that their $5 footlongs were what changed the game in the first place. But regardless on my reservations regarding the concept, I decided to try the Oven Crisp. 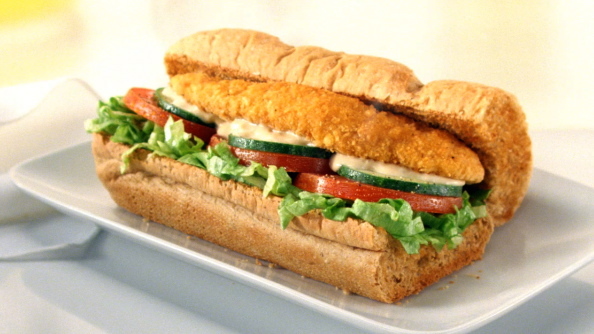 My Oven Crisp Chicken sub included tomatoes, lettuce, cucumbers, and Sweet Onion dressing, which is the permutation recommended by promotional images. It was actually pretty good. I’m never crazy about Subway’s lettuce, but I got a small enough amount of it that it didn’t detract from the sandwich overall. The cucumbers were a refreshing flavor which worked well with the chicken, which was tasty but of uncertain quality. I didn’t dissect it to be sure, but it didn’t taste or feel like all white breast meat or anything. 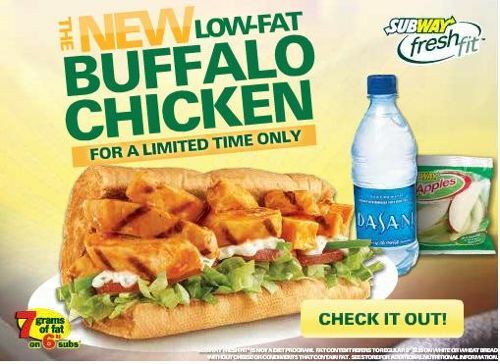 I don’t have any issue with the super processed chicken of most fast food companies, but Subway seems like they’d have higher standards. Anyway, what really made the sub was the Sweet Onion dressing. It’s pretty forgiving, and with an already decent recipe to work with it really shines. All in all, the Oven Crisp Chicken was a pretty delicious sub. I always prefer larger cuts of meat on Subway subs, like chopped chicken or steak, because I think other chains do deli style cold cuts better. This didn’t disappoint, and I’d recommend picking up the footlong for $5, it’s a great meal. Another month, another Subway Featured $5 Footlong. August’s offering, much to my chagrin, is the Buffalo Chicken sub. I’ve never been a fan of Buffalo sauce. It’s spicy without enough of a flavor, and it tastes like vinegar to me (and not in the good “Salt and Vinegar Chips” way). But I missed last month’s sub, so I figured I owed you guys this one. I made it my mission to create a Buffalo Chicken sub I could actually enjoy, using the ingredients available to me. Let’s see how I did! Apropo of nothing, but doesn't Mission Impossible: Ghost Protocol look great? If there's one thing Tom Cruise is good at, it's shooting guns and jumping off of stuff. I began by adding Monterrey Cheddar cheese, to lessen the bite a bit. I had it toasted, then applied tomatoes and Ranch dressing. (Until Subway starts offering real leaves of Romaine lettuce, as opposed to the napkin-like shredded Iceberg they currently use, I won’t be adding lettuce anytime soon.) It actually ended up being pretty decent. While Bleu Cheese dressing is really the ideal counterpoint to Buffalo sauce, Ranch is a passable alternative,and the tomatoes added a bit of variety without adding heat, the way the recommended green peppers could’ve. If I were to do it again, I might add mayo, onions or a stronger cheese, but I enjoyed it as it was. Being a Featured sub, it’s $5 for a foot-long sub, which if I haven’t mentioned before is a really good deal. If you like Buffalo Chicken, you’ll probably like this sandwich. If you don’t, you can try a similar strategy to what I did, or you can skip it altogether. Another month, another Subway featured $5 footlong. I’ve been impressed with the variety of the specials, everything from breakfast subs to meat-heavy meals to lighter fare. 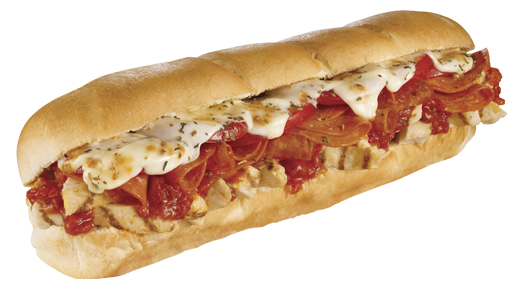 This month’s sub is the Chipotle Chicken and Cheese, which as the name suggests is a chicken sub with Subway’s Chipotle Southwest sauce. They’re not new ingredients, but it’s a new combination, and the idea of combining flavors is really what I’ll be discussing. DAMN, that is a good picture of a sandwich!!! The Chipotle Chicken & Cheese is usually shown with green peppers and red onions on their flatbread, which gives it a kind of “Mexican fajita” air. I got mine with pepper jack cheese to go along with that theme. The chicken and chipotle sauce combo was very good, and I could see what they were trying for with this sandwich. However, the red onions were pretty strong, and they overpowered a lot of the other elements. Pepper jack cheese was also a little strong for the sandwich. The Chipotle Chicken and Cheese is a good idea for a sandwich, but it needs some personal tweaking. I’d recommend going easy on the red onions, if not eliminating them all together, and trying other options, like banana peppers or cheddar cheese. It’s a good $5 footlong, maybe even as good as the Meatball Pepperoni, but you need to think outside of the suggested ingredients to really make it great. 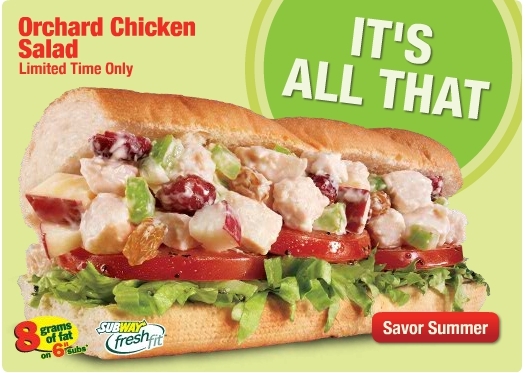 This May, Subway has selected their Orchard Chicken Salad sub to be the latest $5 Footlong of the month. The timing of this one is interesting, because Arby’s just added a Grilled Chicken and Pecan Salad sandwich to their Market Fresh menu. I thought it would be an interesting, unique idea to review them side by side and see which one is better. Then I visited Arby’s Facebook page and saw that they had the same idea. They even made a graphic for it. Sirs, I am outdone!! Still, I doubt any of their Facebook fans have the dedication to sandwich quality I’ve demonstrated, so hopefully this becomes the definitive review of the two. These sandwiches are a bit outside of the usual fare I cover here on Sandwichtalk (for more on my usual fare, type “bacon” or “BBQ” into the search field on the right and see what comes up). I’ll admit that the combination of fruit and mayonnaise is kind of a turnoff for me on a conceptual level, but I can get past it. I’ll be comparing the two in a couple different categories, so let’s get started! First, and most importantly, I’ll begin with taste. Both salads were made up of pretty similar ingredients, including chicken, apples, and celery, mixed with mayonnaise. 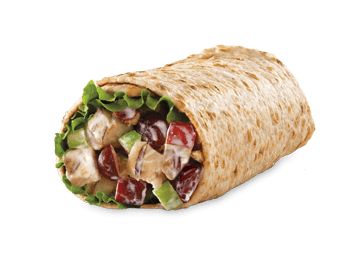 The Arby’s version, which I had in the Whole Wheat Wrap iteration, includes grapes, pecans, and leaf lettuce, which is actually really nice. It tasted alright, although the celery was cut a bit thick and it threw the texture off. The Subway recipe, on the other hand, included raisins and cranberries, and I got mine on Italian bread with lettuce, although I removed most of it halfway through. The celery was cut thinner, which was nice, but the real win here were the cranberries, which added an interesting kick. The pecans were a nice touch on the Arby’s side, but not enough to win. Walnuts would’ve been better. Next up is nutrition. I don’t usually cover nutrition info on Sandwichtalk, because my assumption is that you understand that eating at a fast food restaurant is by definition not going to be as good for you as a home cooked meal or eating at a nicer, more upscale venue. However, given that the main thrust of these sandwiches is as a light, healthy alternative to mainstream fast food, I thought it was worth a look. According to Subway’s website, the Orchard Chicken Salad contains 370 calories, 8 grams of fat, and 560 mg of sodium. Compare that to the Grilled Chicken and Pecan Salad, which according to Arby’s contains 630 calories, 41 grams of fat, and 1020 mg of sodium as a wrap, and 840 calories, 44 grams of fat, and 1220 mg of sodium on the honey wheat bread. Neither seems like an ideal choice for a diet, but Subway is the clear victor here. Finally, we have value in terms of price. This one is a bit more complicated. Arby’s is offering a free sandwich with purchase of a drink via a coupon on their Facebook page. If you use this coupon, Arby’s is far and away a better deal, since a drink is only about a dollar and a half. Without the coupon, the Arby’s sandwich is about $4.79 for the sandwich and $6 for the combo, which includes fries and a drink. For just the sandwich alone, Subway is a much better deal, being a footlong. However, if you want a meal, and I would suggest getting one since both sandwiches aren’t hugely filling, Arby’s is probably a better bet, since Subway combos will run up to around $10. Given the nutritional facts and all around taste, I have to give the title of Best Fruity Chicken Salad Sandwich Special to Subway. Both have their pros and cons and neither is quite what I want (hint- cranberries and pecans would be an amazing combination), but I’d eat the Orchard Chicken Salad again much sooner than I’d have the Grilled Chicken and Pecan Salad. If you disagree, I’d love to hear from you in the comments!! P.S. No matter who you side with, be sure to vote on the Arby’s Facebook page. They’re donating $1 for every vote to the charity No Kid Hungry, so that’s pretty cool.